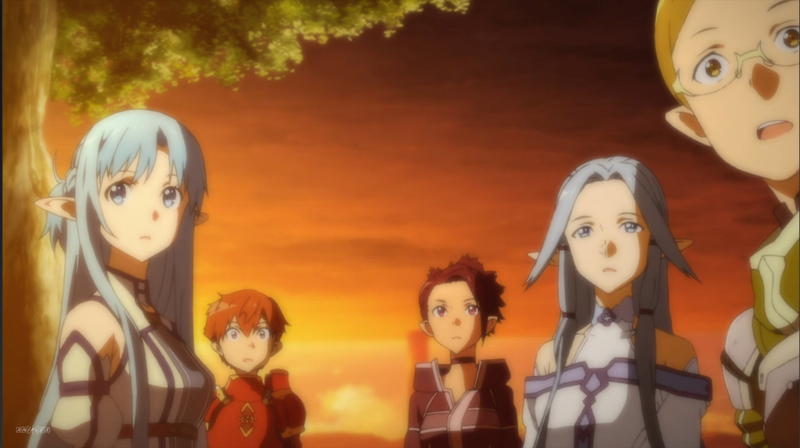 As part of my return-to-anime rehab, I literally ran through the entire Sword Art Online II in several days. If an anime can keep me watching without having to take a break to go watch something else, I'd say it's at least a somewhat interesting series. However, I think SOA II stops not very far beyond that. If you have seen the original SOA, you'd find it's really not much new in this second season. The series is actually made of several arcs, with the first one occupying the entire first half of the series and several smaller ones all stuffed into the second half. Throughout the first half, I found myself keep asking questions like "Why don't they just..." and "How could they not know..." and "How come nobody see...", because even for the SOA world, some of the things they did are just a bit too farfetched to believe even though I was already in the willing suspension of disbelieve. Each of the arc is more of less independent from each other, because the arcs that has plot dependencies from previous arcs has just as much of the tie-in as some of the random out of nowhere add-ons. So if you haven't seen the previous arc, you could just assume it's something they added for plot purpose without knowing the background of the add-on. On a side note, if you feel like in need of a crying fest, you could jump directly over to the last arc of second half of the series. As someone who appreciate stories play out tragic plot lines without using cheap escapes to avoid them, I do like how that particular arc was developed into. Recommendation: If you have become somewhat emotionally attached to the characters from the first series, you'd probably want to follow up on this. Even though it doesn't add much more depth to character development, it is interesting to see what is the life after SOA is like for those characters. But if your opinion for the original series is "Meh", the it's safe to just let this one go, you probably won't get much more out of this franchise.